I bought a new mobile phone and I need to transfer my personal items to the new phone. How can I do that? Hi Barbara, thanks for your question. Kindly note that you can transfer data from one phone to another using Backup feature of Mighty Grocery. First, you will need to create account on your old phone. Second, go to More –> Backup on cloud –> Create backup. Third, on your new phone log in to the account you’ve created on your old phone. And finally restore backup on your new phone. upgraded today to the full version. great job! very useful software! Hi Francesco, thank you so much for your feedback. Regarding your question, first, you will need to choose measurement unit such as Kg or Grams. Then you need to set Unit Price for the item. Finally, set 350 in Qty field (or 0.35 if you selected Kg as measurement unit). Please see Edit item User’s Guide for more detail. I’m very confused by all the variations on sync pull and push and backups??? I have made a backup from my account on my phone and would like to restore it to my tablet. The error occurs saying that there is no list associated with my email account when I try to restore a backup but there is. At least it said the backup was successful. This really does not need to be this complicated. why so many variations on sync, accounts, push pull and backups? Remember the KISS principle. I really like this application. It needs simplification though…. Hi Whitt, thank you for your honest feedback. I agree that List Sync feature can be simplified, some of them are planned to get rolled out soon. In the meantime I’d recommend seeing the List Sync User’s Guide for more details. Thanks and please let me know if you need any further assistance. Alex thank YOU for your kind reply. Good to see a dev in the spirit of things! I finally figured it out…..wasn’t straight forward, though. I’m sure it will get better as it matures. I suspect this is a problem with my phone but it takes me quite a few taps, sometimes 5 or 6, to go from the Home Screen to the screen I want. 2.3.3. MG is installed on the phone, not the SD Card. Could you please advise if you always need to make 5-6 taps or this happens from time to time? Also, will rebooting help resolve this issue? When sending a list via sms. The hole list is allways sent even objects that have been struck . Is there a way to only send unstruck objects? Often i have a large baselist and i strike out what i dont need and want to text the remaining objects to another phone . Hi Frederik, thank you for your question. Unfortunately there is no way to filter items you send via sms/email. Could you please advise why do you need to keep crossed-out items on your list? If you checked them out, they won’t get sent. I also changed phones & I have MG downloaded to the new unit. I had quite an extensive base list, both scanned & hand entered on my previous EVO & would like to transfer that list to my new EVO. Can this be done? Hi RoseAnn, thanks for your question. Of course, it is possible to transfer your data to another phone. The best way is to use Backup feature to create backup on original phone and then restore it on your new phone. I set my options to lock the screen so it wouldn’t close while I am shopping or for the direction to change. I have the full paid app but it still blacks out and it still changes direction…please help me with what to do. Hi Cheryl, thank you for your question. Kindly note that Disable screen lock and Disable screen rotation work under shopping list tab only. 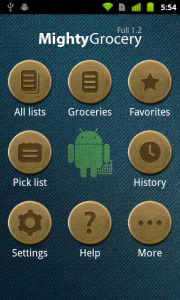 Other tabs such as Pick list or History will allow screen to lock or rotate. Also, due to Android OS defect, screen will not rotate in Portrait orientation only. Thank you for your patience and sorry for any inconvenience. It’s me, Prakash the pest, again! How do I get back to this home screen from any other screen after I am done using Mighty Grocery? The back button on my phone just takes me on a tour of all the screens I visited during the session. It may ultimately get me to the home screen but this could be tedious depending on the length of the tour! 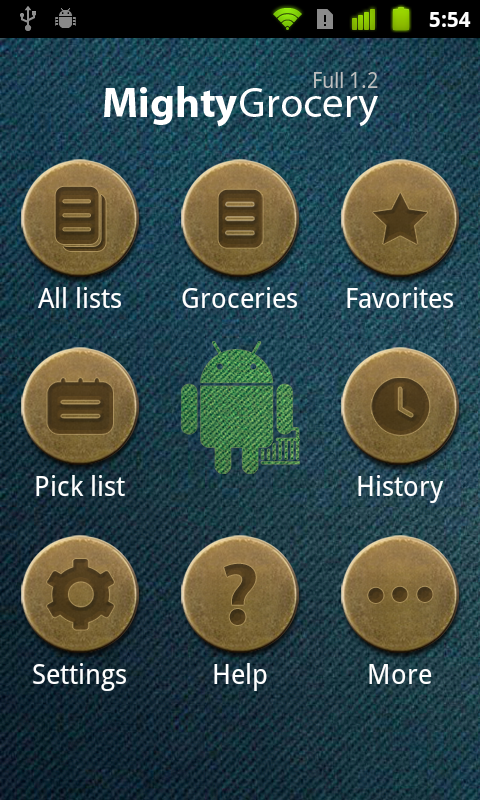 I can, of course, get out of Mighty Grocery by pressing my phone’s home button or even shutting off the phone. But then, when I touch the Mighty Grocery icon, it sometimes takes me to the last MG screen I was on and sometimes to the MG home screen. Would you please explain this behavior? On a similar note, how do I exit out of Mighty Grocery completely and make it stop running? Right now, it runs constantly thereby draining my battery and I have to force stop it using the phone’s utility. Basically, I only want it to run when I am using it for planning shopping trips and while I am actually shopping. Thanks, again, for listening, Alex. Hi Prakash, thanks for writing again! To get to home page quickly, just tap the icon on the upper-left corner. As for exiting app, etc. — kindly note that “Exiting” is uncommon for Android apps. It’s how Android OS is designed. As soon as the app is not in foreground, it will not drain battery and operating system will automatically quit the app should resources be required by other apps. I downloaded and installed your SE Trial version. However, when going to settings there is NO upgrade selection tab for me to make a PayPal payment, nor do I find any place to install a purchase code if I had one. FYI, this application is being used on my Dell Streak 7. Please advise on how to purcbase the app. Hi Lowell, thank you for your interest in our app and your question. Kindly note that “Upgrade” command is the latest option under Menu –> Settings. Also, it is the first option under More tab. I recently changed phones and am wondering if its possible to transfer my full version of the app to my new phone? Yes, just use the same Google account on your new phone. All your paid apps including Mighty Grocery will be available for download at no extra cost. Please let me know if you have any following questions.